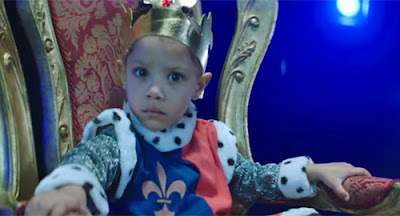 1) "I've been cold the whole season / I should call my next one "Freezing"
2) "All my young black kings rise up / Man, this is our year / And my young black queens right there / It's been a long time coming, I swear"
But the clip, directed by Floyd Sorietu is a gif giftshop, thanks mainly to the fact that Stormzy drips with charisma; although the kids who plays the king has the best "da fuk you lookin' at" face I have ever seen. Here's a few of my favourite moments, followed by the video "in full". "You've let me down, you've let your mother down and, worst of all, you've let yourself down." "Lately, I have begun to feel the effects of the inclement weather."